Training Industry continuously monitors the training marketplace looking for the best providers of services/technologies in support of corporate learning and development. This second annual list is designed to help buy-side organizations in their search for online learning platforms that possess on-demand libraries of courses and content for corporate/individual learning and development. KPA offers online training courses in environmental, health and safety, human resources management, and sales and finance compliance. Our goal is to help clients achieve regulatory compliance, control risk, protect their assets, and effectively manage their employees. Udemy for Business helps companies stay competitive in today’s rapidly changing workplace by offering fresh, on-demand learning content through a powerful content marketplace. Our mission is to help employees do whatever comes next. With 2500+ high-quality courses on the most in demand topics, we set companies and employees up for success. CrossKnowledge is an engaging, forward-looking digital learning solution, driving business outcomes and the ability to transform individuals and entire organizations. We provide a customized, fully integrated learning solution — bringing together our cutting-edge technology and world-class content into a blended environment. Alchemy pioneered training for the frontline production worker in the food industry, designing cutting-edge training solutions that have helped clients reduce recalls and prevent injuries. With Alchemy’s help, food companies know their employees have the knowledge and confidence to make smart decisions about food and workplace safety. Harvard Business Publishing Corporate Learning leverages the management insight, thought leadership and expertise of Harvard faculty and Harvard Business Review authors to provide solutions relevant to today's business challenges. For over 20 years, they have developed and delivered innovative, technology-enabled solutions that drive business results. A global leader in corporate learning, Skillsoft provides engaging learner experience and high-quality content to the world’s leading organizations. Our mission is to build beautiful technology and engaging content that drive business impact. We offer 100 percent secure cloud access, from any device. O’Reilly transforms learning for high-performance organizations that want to understand how today’s technology trends impact tomorrow’s business opportunity. Its platform combines in-person and online learning experiences from the industry’s most respected experts who inspire people to change the world and provide the actionable skills to do it. Since 2004, ej4 has delivered the unexpected in e-learning. Our unique style of microlearning videos combines traditional instructional design with adult learning theories, delivered via contemporary video design methods. SafetySkills is a U.S.-based e-learning training provider that built and maintains a rapidly-growing library of more than 600 environmental, health and safety and HR titles. It produces high-quality, highly interactive content for learners across the United States, Central and South America, Europe and the Middle East. Consulting, instructional design, digital production, graphics, faculty management and outsourcing support… Hemsley Fraser is a turnkey learning and development provider. Our approach to design centers on our robust online learning library, which allows us to rapidly configure highly impactful learning solutions in a unique, cost-effective way. We empower customers to enhance workforces, manage compliance and advance careers through technology-based personal learning. This mission helps us maintain a robust offering of courses that fit the needs of the learners we serve. Degreed, is your one-stop shop for learning. It helps you discover the skills and experts you need to stay ready. Set goals, track your progress and build your skills however and wherever you want to. The BizLibrary Collection contains more than 6,000 micro-videos, covers a wide variety of topic areas and includes support materials to increase retention. Learners receive unlimited access to our library, which covers topics important to businesses today such as HR compliance, business skills, workplace safety, leadership and software. With an accredited content library and free courses—that are video-based, entertaining and device agnostic—added regularly, Litmos Heroes provides a great off-the-shelf content library for its clients! Modules cover a broad range of topics and are constantly updated to let you focus on more important matters. Media Partners Inc., is a leading provider of learning content and performance support libraries, offering a wide variety of online training solutions. DashTrain GO, their new mobile-first application, contains thousands of micro-video and audio learning bites that can be accessed anywhere and at anytime. Vector Solutions, a leader in e-learning and performance support, provides award-winning SaaS solutions for the architecture, engineering, construction (AEC), industrial, manufacturing, facilities management, public safety, IT and education industries. Simplilearn combines a narrow curriculum focus on IT and digital economy skills, developed and updated by leading industry experts and luminaries. Simplilearn’s instructors are also selected from actual working practitioners in their fields. Simplilearn utilizes a blended learning approach to maximize course completion. Since 1970, Pryor has helped 11+ million people and 300,000+ businesses attain career goals by offering comprehensive, affordable and convenient business and leadership training. Over 10,000 training opportunities are offered live and online, along with learning assessments, curriculum planning, gamification, microlearning content, and more. Mind Tools' corporate solution helps organizations of all sizes to improve employee engagement levels by providing a consumer-style, on-demand learning environment. Thoroughly researched and trusted resources are updated daily and are available to access via any digital device. 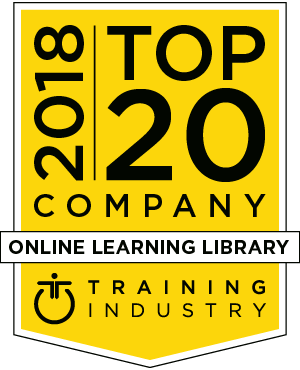 As part of our commitment to continuously monitor the training marketplace for the best providers and services we announce the 2018 Online Learning Library Companies Watch List. This list recognizes companies from all over the globe that provide online learning library services. The 2018 Online Learning Library Watch List is intended to help buyers of training services evaluate online learning library providers. With over 3,000 industry-leading online courses, we provide organizations with a single source for assessments, skills training, continuing education, and more. We help employees enhance critical skills, meet continuing education requirements and compliance mandates, and gain the knowledge they need to work safely and efficiently today. GP Strategies is a performance improvement company dedicated to helping customers increase knowledge, improve performance and significantly impact business results. Our consultative approach and product and service lines are dedicated to helping customers gain a competitive edge by ensuring the peak performance of the organization as a whole. Baker Communications offers a full-range of e-learning options for the seller community. These options include our L.E.A.P. platform that is a new generation of e-learning products, our Sales Mastery on-demand video library, and our KnowledgeNow/MessageNow products, which allow you to embed training and coaching into most CRM’s on the market. InfoSec Institute fortifies organizations against cyberthreats with award-winning security education. Recognizing cybersecurity is everyone’s job, we provide skills development and certification training for IT and security professionals, while building the entire workforce’s security aptitude through awareness training and phishing simulations. Cornerstone OnDemand is pioneering solutions to help organizations realize the potential of the modern workforce. As a global leader in cloud-based learning and human capital management software, Cornerstone is designed to enable a lifetime of learning and development that is fundamental to the growth of employees and organizations. Pathgather is a learning experience platform for leading enterprises seeking to stay competitive in a rapidly changing landscape. It works with your existing learning ecosystem and HR tools to create talent agility within your business, and makes it fast and easy for employees, L&D teams, managers and SMEs to create, curate and share learning content. Developing a training course with content that is educational, interesting, and follows federal and state requirements can take more than 40 hours of work. But that’s where TrainingToday® can help! Velociteach is a professional training company with the goal of empowering others to learn project management in a dynamic and engaging way that also encourages personal and professional growth. Learn from subject matter experts while earning professional development units or preparing for a certification with their online platform, InSite. If your people aren’t at their best personally, they won’t be at their best professionally. CreativeLive classes in creativity, innovation, emotional intelligence and well-being help your people become more strategic, engaged, and resilient in work and life. We go beyond training employees. We’re committed to developing well-rounded, successful leaders.